So studio is being reclaimed. 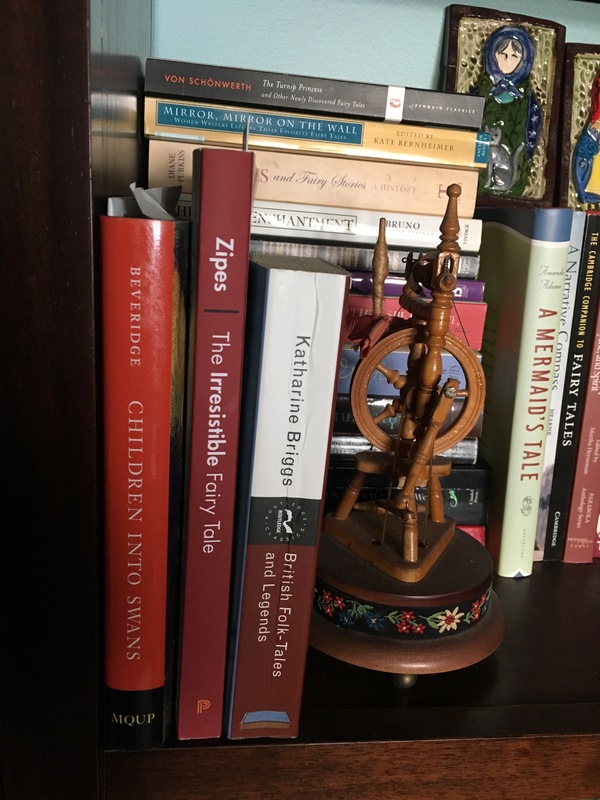 Organizing, decluttering, displaying treasures to free up space on my work table. Now I want to look forwards. 2017 was a year I was happy to say goodbye to… aside from the greater world situation/trauma/news/horror I had some personal challenges, and family issues that were , well – upheavals. 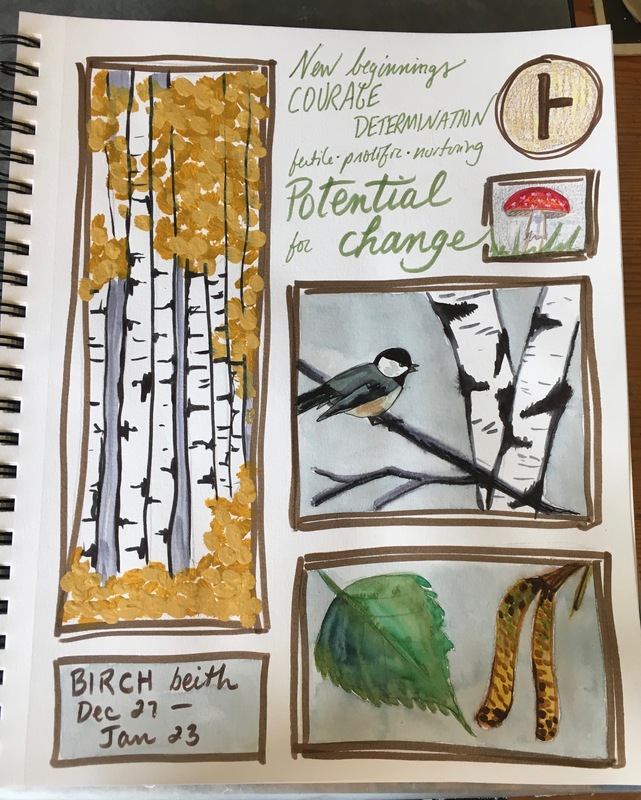 My “Birch” page as I study the Celtic tree calendar. 1. Jump start my art journal practice. This is a project I an renewing this year for the third in a row. Last year I made it halfway through the year, before stress derailed me. And that was an improvement from the prior year! Im working large, IMO, in a 11 x 14″ spiral bound mixed media sketchbook. There will be watercolor, collage, drawing… whatever I want! This is a practice for me alone, and while I may share some spreads on my IG, I can play and be messy, and do art therapy, and no one needs to see. 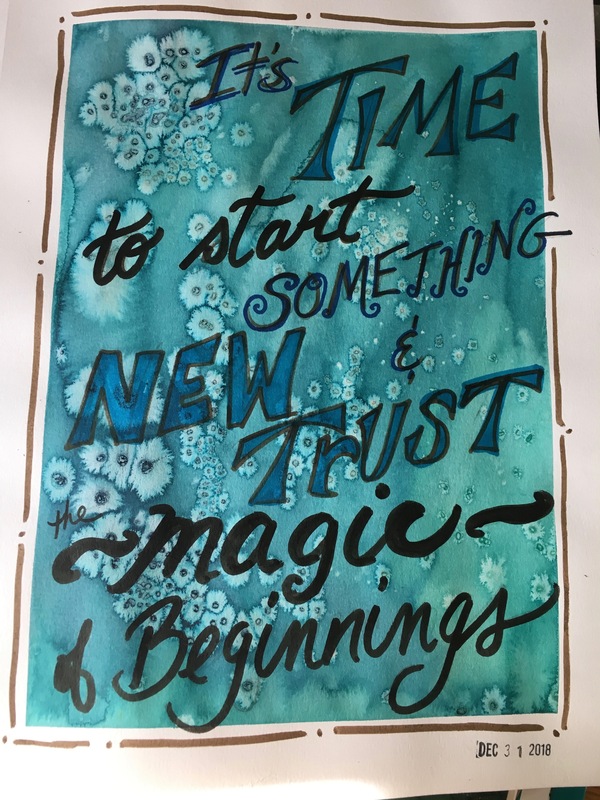 Im taking a yearlong class called Moonshine with Effy Wild ( of Journal52 and Life Book) and so far love the themes and prompts presented. 2.Read. In the last few years of living this creative entrepreneur’s life, my reading levels have plummeted. I work all day in the studio, at my part time job, in the “work” ceramics studio… and only read after i crawl in bed. Yeah, < laughs> that doesn’t work out so well. 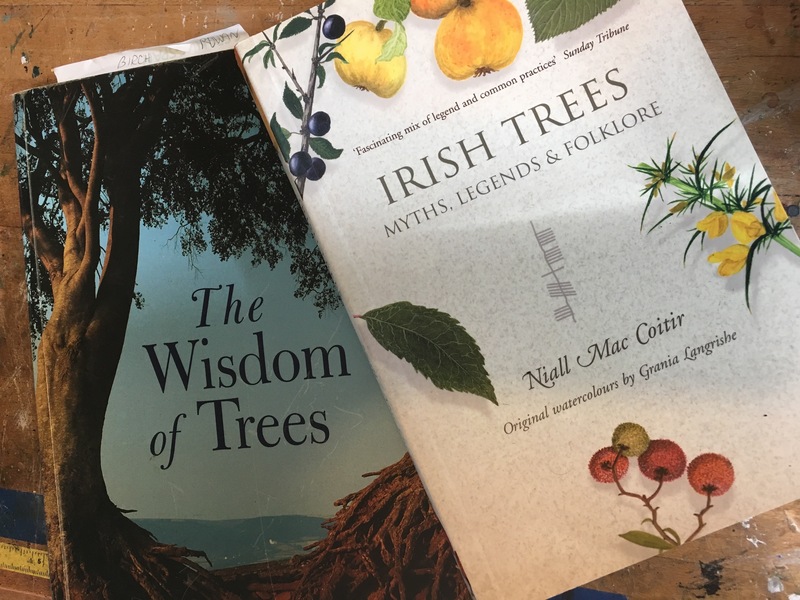 I have a growing pile of mythology, women studies, fairy tale analysis, art and technique books which ARE work related. So I CAN read during the work hours…. 3. Play. This past year I was stuck in a rut of production. I started the year strong, and spent the summer and fall making new work just in time for the next show. Needless to say, I didn’t have the time to try new things, to play, to experiment. And I felt stagnant creatively. This year I am working part time at the fabulous Sarafina Fiber Arts “Art House“. The environment and the product are very conducive to creativity. I want to felt and bead and sculpt. I want to try polymer mosaics. I want to do larger tile pieces. I want to do another series of goddess figures… See? 5.Health and happiness. This one really needs no explanation. As I mentioned earlier – family health issues. Health is prioritized! 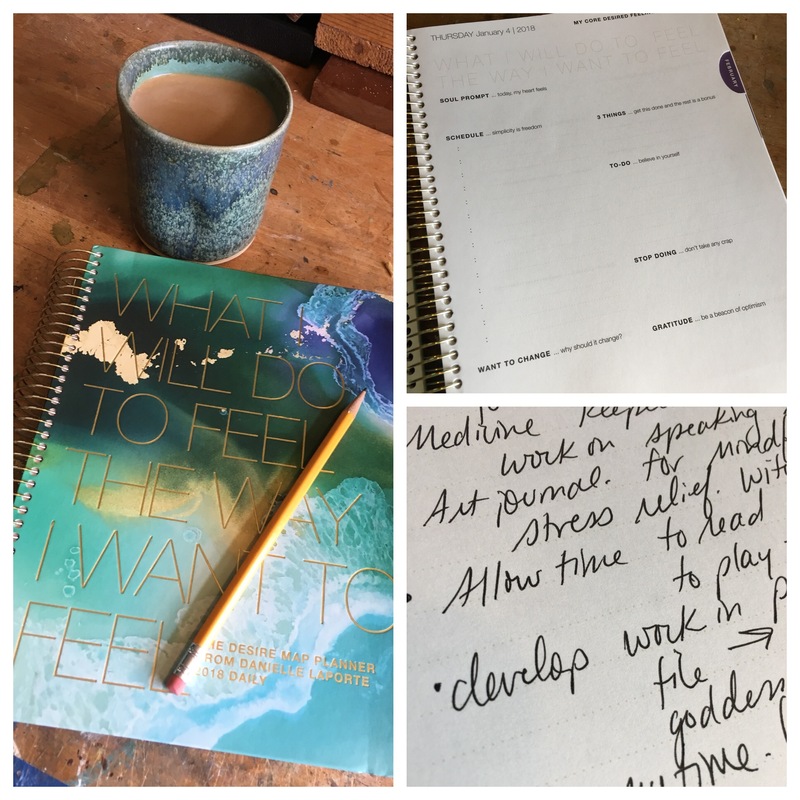 Mental health, meditation or the like, down time. Hydration! Healthy eating. I am trying to shift my mindset of preparing dinner from a chore, to a mindful daily ritual. Think good music, and bocking the time in so I am not so rushed. 6. Overhaul my tile inventory. As in retire old designs! Design new tiles! And sketch them… I have a few molds that are worn out and need to be done. 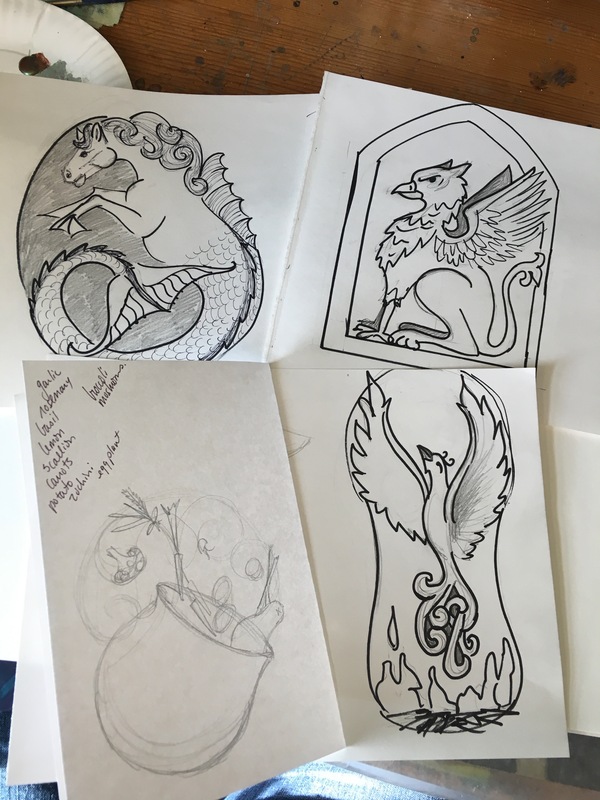 I have SO many tile designs in my head – I am trying to get them on paper and start sculpting! My first arts festival of the year is in May – and I want to debut mythical creatures. As always I will have mythic themes, gods and goddesses, and I am developing a new line inspired by the comforts of home. Think coffee, books, pets, tea… What would you put on the ” Comforts” list? But I have to be practical as well – some designs will be custom order. Others – the most popular designs – will go with me to shows. I plan a series of smaller tiles for the 4 elements that can be purchased singly or as a group…. And if there are new tiles there will be new pendants to correspond! labradorite, sawing out script, tray of to-do’s! 7. Metals – metals were my first love in art school. I sincerely adore sawing complex things with my jewelers saw. So why aren’t I doing more?! As I established myself and my business; applying to shows… ceramics was the best category in which to place my work. 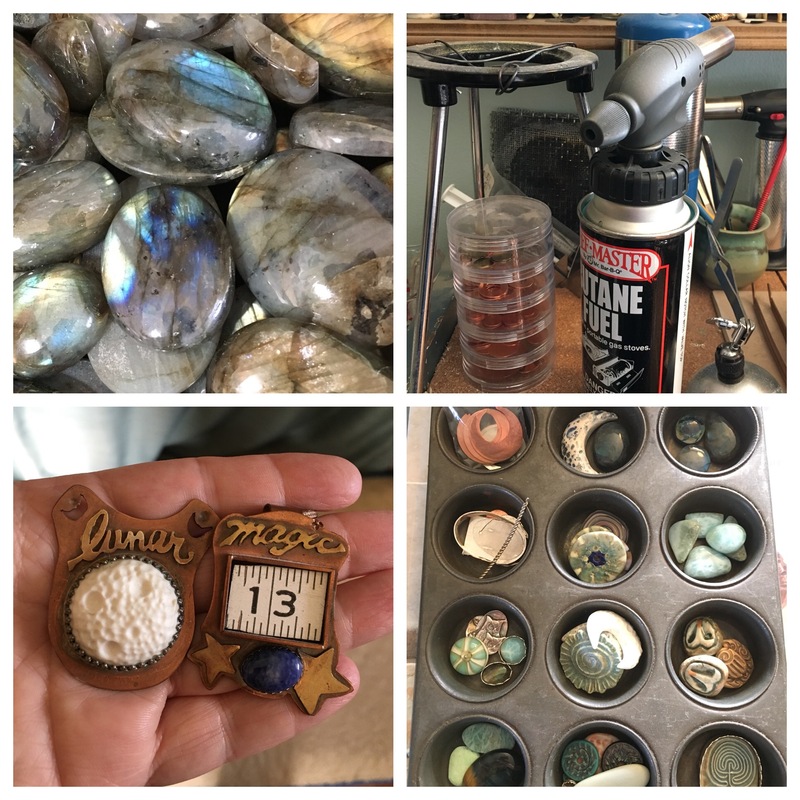 Tiles, shrines, pendants… But in my heart I am a mixed media artist. So more metals? Yes, please! 8. Linoleum printing. I used to teach it in school. 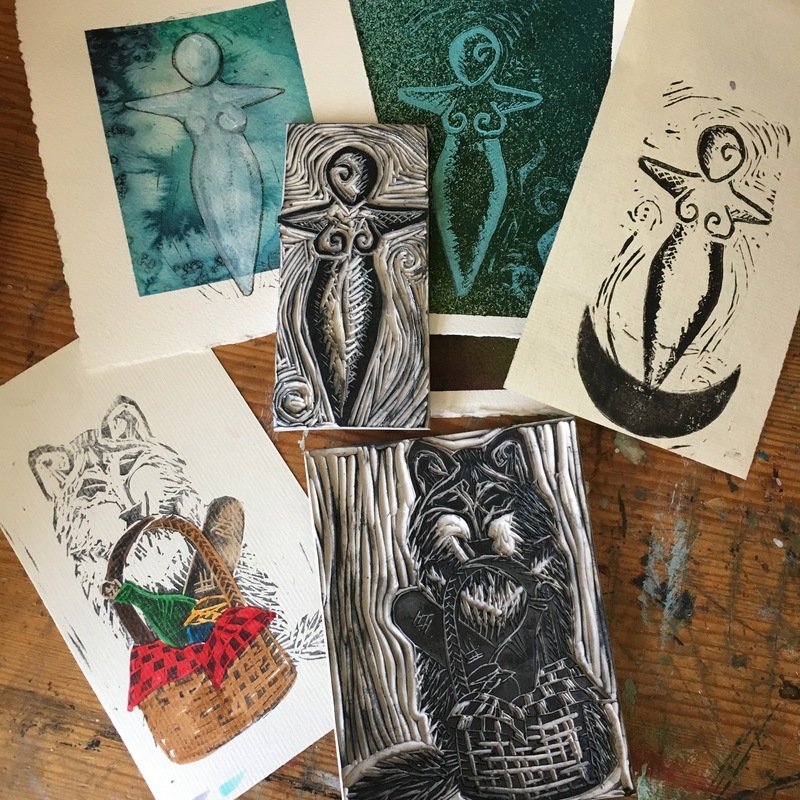 Lesley and I did a print making art camp a few years back… You may have seen prints I was playing with for our 2017 “Keep your Sanity” challenges… During 2017 I took a few online classes with the Carterhaugh School of Folklore and the Fantastic. For the fairy tales course I did a series of lino prints – I wanted to do something not in my normal mediums, and play a bit. I found that it was a great exercise to encourage me to draw more, and I find the carving rather Zen. The goddess and Little Red Riding Hood pieces pictured above? The goddess image correlates with a tile a sculpt, and I am thinking the wolf may be translated into clay soon! I like developing ideas and translating them into different media! 9. Travel. Starting the year off with a trip to the UK! Art camp with Lesley! And – actually meeting my dear friends of the UK branch of Art Elements… IN PERSON! But after that extravaganza… my desires are simple. Time with the husband and the dog, time in nature. The picture above? 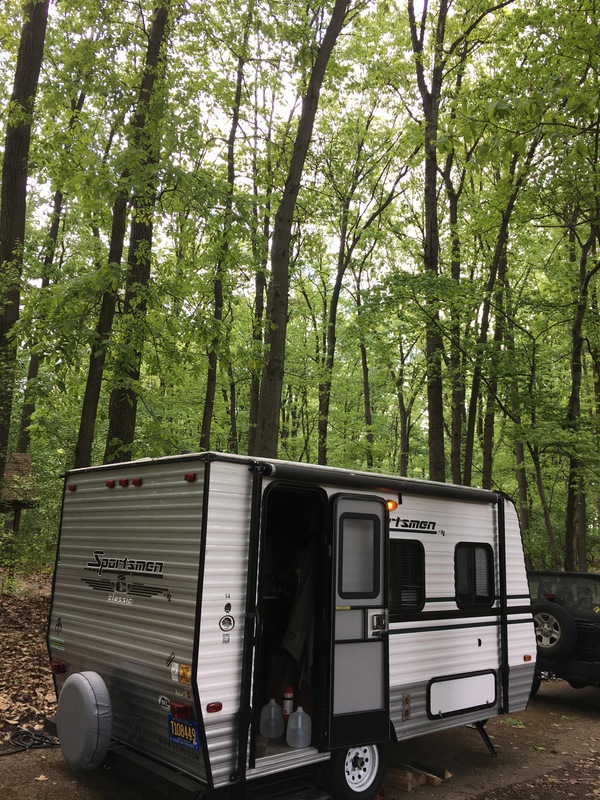 Our tiny 14′ travel trailer. She is adorable. We have no plans yet – but now as we are snowed and cold – that’s the time to make them! 10. Friends, family and community – Spending quality time with the people I care about. Not letting the job get in the way… and that means online friends and community as well. Taking the time to comment and start a conversation instead of blindly clicking “like”. Spending less time mindlessly scrolling, but quality time touching base with friends that are far away. Video calls to watch my little nephews antics… Stop what you are doing and hug someone today! I blog for ART Elements!